Framing and hanging pictures and photographs are one of the easiest and most common ways to add decor and style to any home or office. Whether it’s a friend, family member, mentor, or just someone special, keeping a photo of them around keeps them close to the heart. But, with so many special people in your life, why use the same plain, solid frames for every photo? Personalized picture frames, whether with quotes or added family names, are an excellent way to pay homage to your loved ones. For many people, their wedding day is one of the most important, memorable days of their lives. Brides and grooms often pay a fortune to ensure they have the best photographer present to capture these important moments. When framing your favorite photos from that day, wedding date picture frames or picture frames with quotes are great alternatives to average Joe picture frame. Instead of giving a family name sign as a gift to your parents, why not try a personalized picture frame with a family quote or family name? 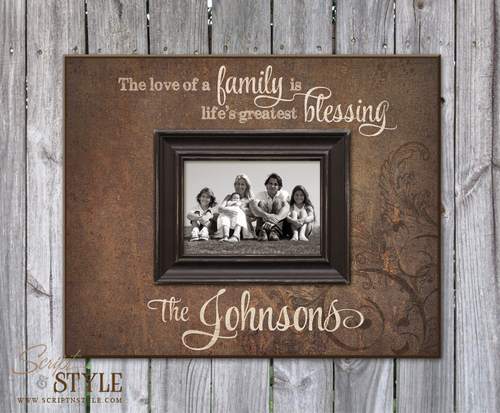 Picture frames with quotes like “the love of a family is life’s greatest blessing” adds a personal touch to the photo of your family or parents, further showing your love and appreciation for them. Family name signs are a common gift for parents, so why not take it to the name level by turning it into a frame. We all know life is better when we have our best friends by our side, so why not show them? With a best friends picture frame, you can add your names with your favorite photo for extra personalization when giving him or her a gift. For many people, their best friend is their husband or wife, making a best friends picture frame a great gift for them too. After losing a loved one, you start to feel more sentimental towards the time spent together and the time lost with the loved one. Don’t let the memory of them fade. Instead of keeping that wallet photo of them, buy a personalized picture frame to put on your desk or in your home. Personalized picture frames also make great sympathy gifts for those who have recently lost a loved one. Moms and dads can all agree that their little rugrats rule their lives. And although they may be unruly at times, they are a blessing. Commemorate their birthdays and other special days with personalized picture frame with special dates. Buy one frame and list the birthdays of your children, or buy a frame for each child with important dates specific to them such as graduation dates and wedding dates. Personalized picture frames give context and meaning to the framed photos, so no matter who looks at the photo, they will know the importance of the loved one in the photo. Not only do personalized frames help give context to photos, but they also provide additional decor to your house, creating that home sweet home feel.